On February 4, Datsun India started producing its cars at Renault-Nissan's Oragadam plant in Chennai. Now, the bookings for the GO have started in India. The car can be booked for Rs 11,000 with deliveries slated towards the end of March this year. Datsun had showcased the GO first on July 15, 2013 in India and after a few months the GO+ was unveiled in Indonesia. Both these cars were also unveiled at the Auto Expo 2014 alongwith a global concept, the redi-GO. The GO is said to have as much as 90 per cent of its components from local suppliers. At the time of unveil, Datsun India had assured the media and probable buyers alike that the GO will be priced under Rs 4 lakh. Moreover, the interiors are unlike a budget car with a phone holder and comfortable seating for five passengers including the driver. The Datsun will be launched initially with a 3-cylinder 1.2-litre petrol engine from the Micra. It is expected to have fuel efficiency in the region of 20kmpl. Datsun will offer the car with a two-year/unlimited km warranty. A diesel engine for the GO may also be made available at a later date. 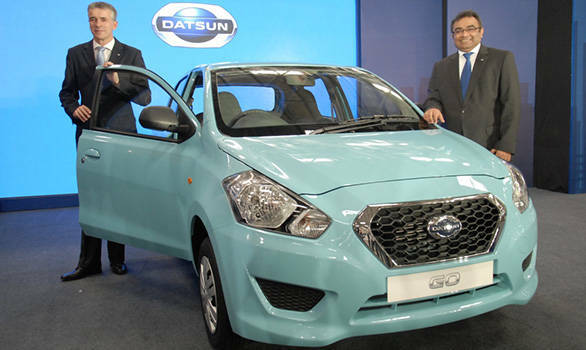 Datsun India is also expected to export the GO to other markets at a later stage.